Police Chief Josie Gray is living every cop's worst nightmare: a murder suspect who she knows personally. Even worse, it's her longtime boyfriend, Dillon Reese. Dillon's secretary has been murdered, and now Dillon's disappeared. Josie has no choice but to relinquish the investigation to a fellow officer, giving up control of a case that matters more than any other. As suspicions split the department, Josie struggles with her choices on the night she last saw Dillon. If she had acted on her instincts, would the innocent woman still be alive? Unable to stay on the sidelines, Josie investigates on her own terms--and uncovers a plot that could bring the killer millions. Now she must make a choice between her oath as an officer and her personal desire to get revenge. 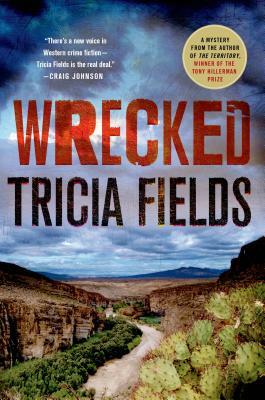 Tricia Fields's "Wrecked "continues the Hillerman Prize-winning mystery series that captures the unique landscape and characters who populate the small towns of West Texas. Tricia Fields lives in a log cabin on a small farm with her husband and two daughters. She was born in Hawaii but has spent most of her life in small-town Indiana, where her husband is a state trooper. She won the Tony Hillerman Prize for her first mystery, The Territory, which was also named a Sun-Sentinel Best Mystery Debut of the Year and was followed by its sequel, Scratchgravel Road, in 2013.